East LA high school students at the “How to Empower Your Community With Mobile Stories” workshop held at East LA College. Latino students from East Los Angeles, community activists, and immigrant youth gathered last weekend at East LA College to discuss topics on immigrant rights and youth empowerment through community news at the “How to Empower Your Community With Mobile Stories” workshop presented by the East Los Angeles College Student Equity Program, the Spanish weekly newspaper Hoy, and Boyle Heights Beat, a local publication. 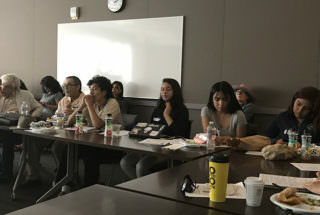 The participants learned from experts about community empowerment, their civil rights, and the role of community journalism in underserved communities such as Boyle Heights. They learned in particular how to organize and communicate issues affecting other largely Latino communities including Highland Park, Lincoln Heights, La Puente, South Central, and Southeast LA. A major part of the Saturday workshop was dedicated to teaching youth about undocumented immigrant rights: how to protect their loved ones with no legal status in the country from being deported, and how to interact with immigration and local law enforcement agencies. Yanira Lemus, an attorney from the Loyola Immigrant Justice Clinic, and Victor Narro, project director of the UCLA Labor Center (right). Victor Narro, project director of the UCLA Labor Center, was one of the panelists who stressed the importance of being prepared for when they or their families come into contact with law enforcement agents and knowing their own rights and the rights of members of their communities who are undocumented. “You have constitutional rights. However, law enforcement agents are not trained to have a discussion on constitutional law, therefore you must always avoid escalating the issue,” he said. 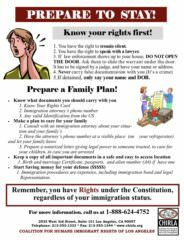 Narro urged youth in those communities to have a preparedness plan on what to do when they or any family members are detained. Students in East LA, in particular, have been affected by changing federal immigration policies. One case that garnered media attention is that of Claudia Rueda, a student at Cal State Los Angeles who was arrested in May by agents from U.S. Immigration and Customs Enforcement in front of her Boyle Heights home and was threatened with deportation. About 20 days later, a judge ordered her release from a San Diego detention center. During her detention, many community members and students rallied to support Rueda urging immigration authorities to dismiss her deportation order, which still stands, according to the latest reports. One of the rallies was held outside Roosevelt High School, where she had taken classes. Some of the students who attended Saturday’s workshop are Roosevelt students. Another event in the community and that caught national attention was that of Rómulo Avelica-González, the father of a student attending Academia Avance charter school in Lincoln Heights. He was driving his two daughters to school when he was pulled over and taken into custody by ICE agents. 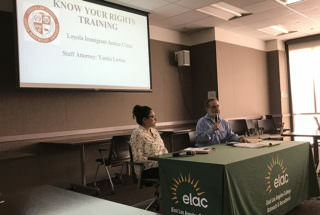 Yanira Lemus, an attorney from the Loyola Immigrant Justice Clinic, presented some legal advice at the workshop on what to do if an undocumented person is detained by an immigration agent or any other law enforcement agent. Martín García, an East LA community activist with LA Voice, told students how to be involved in policy advocacy on education, advancement opportunities, and equal housing access as gentrification was mentioned as one their main concerns. Gentrification happens when more affluent residents move into and renovate deteriorated urban neighborhoods. “I think we should be involved in the process, not to be biased just because of race, but to be prepared to take advantage of the benefit gentrification may bring to our communities. We should the ones who benefit first from new jobs or educational opportunities,” said Cesar Medina, a youth empowerment activist in Highland Park. Some of the participants in the workshop are bilingual writers of the Boyle Heights Beat/ El Pulso de Boyle Heights, a bilingual community newspaper produced by local students — most of them LA Unified students — that has been featured in The New York Times. “Our youth deserve to be empowered with the tools of journalism to share their own stories,” said Antonio Mejias Rentas, the senior editor of the publication who shared that her team of young writers is preparing to publish a piece on gentrification that was reported and written by students of the Boyle Heights community. “Almost none of the stories we see right now in mainstream media reflect our reality or are useful for us,” said one of the workshop participants.